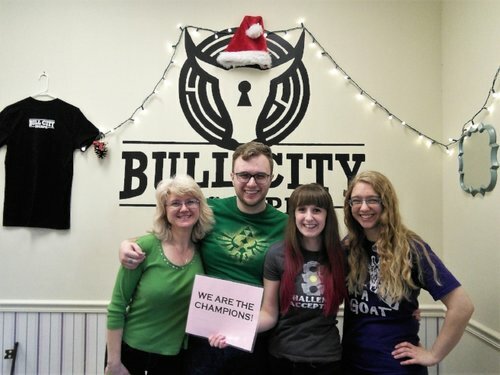 When Chrissy Lemmons' family first began their adventure at Bull City Escape, they were running around, yelling at each other and trying to find all the clues at once. But then each family member fell into their role. Her brother, a natural leader, kept them on time and on task. Her engineer sister focused on solving puzzles. Lemmons, a UNC student, became a facilitator with the walkie-talkie, connecting the puzzles and making sure everyone knew how their work fit together. With that kind of teamwork, the Lemmons family escaped the room with 24 seconds to spare. They beat the odds — only 30 percent of groups get out of the room within the one hour limit. Bull City Escape is part of a growing trend of entertainment rooms that challenge the brain and group dynamics. Groups of two to eight people are locked in a room for 60 minutes — the only way out is to find and solve a sequence of clues that leads to the final combination. The concept started with online games, then evolved into interactive, real life rooms. Bull City Escape has three rooms, all with 30 to 39 percent success rates. A Study in Murder tops the charts as the hardest, its room resembling a Victorian parlour. Lunar Lockdown is a spaceship setting, and The ‘90s Room depicts quintessential ‘90s pop culture, Beanie Babies and all. Bull City Escape founder and owner Alice Cheung has a background in psychology and education. She designs each room with the player in mind. She knows people have different types of intelligence, and therefore can approach tasks differently. Bull City Escape attracts families, groups of friends, tourists, companies, mystery and puzzle addicts for celebrations, fun, and bonding. Groups tend to start in a state of chaos of finding clues and exploring the room for the first five minutes, but eventually members break off, taking on different kinds of roles depending on the dynamic of the group. Players tend to gravitate towards roles that adhere to their strengths to help the team get to the next step. What role will you take on in 60 minutes? The coordinator takes on a leadership position, making sure they’re aware of what each member while keeping an eye on the countdown timer. They might take notes, and they'll need great listening skills so they can understand what different groups of people are doing around the room to connect clues. The coordinator keeps the group cohesive and efficient. The investigator takes on an action-oriented role by finding and identifying different puzzles. They try everything out at least once, and delegate different tasks to members. They don't get stressed easily, so they help keep the group calm. Codes and Ciphers: If you’re into Sudoku, these puzzles may be the most fun for you. “Puzzles with a lot of numbers I give to my sister,” Lemmons said. “We divide puzzles with what we know how to do, and it bonds the group together.” Code-breakers think like Indiana Jones: they read the signs and numbers to find deeper meanings, solve combinations and open locks to get to the next step. Spatial Reasoning and Awareness: These puzzles require players to navigate and analyze three-dimensional images and environments.These challenges may involve noticing details around the room that seem mundane at first, but ultimately work together to solve the puzzle. Logic: Here, a sleuth must observe and draw associations between different elements in the room to help solve clues. The puzzles require you to be able to distinguish between clues and distractions. “You’re never 100 percent sure what’s a clue and what’s a decoration because all things seem like they mean something,” Saia said. Bull City Escape is open Thursday through Sunday, and upon request for private groups. To book a game, visit its website.